Measure your Wraps per Inch with this invaluable tool. Matches up CYCA Yarn Numbers and Yarn weight to enable you to substitute yarns in patterns. Invaluable for weaving and spinners. Measure the number of times that your yarn wraps around the tool up to the 1 inch mark. Count the wraps and that is the WPI. 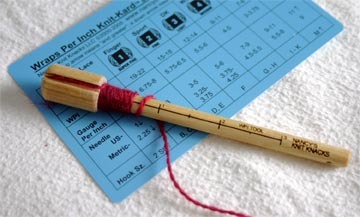 Then check the chart on the WPI Knit-Kard (included), and that will tell you what weight your yarn is.